Founded in the 12th century, this was the first Augustinian priory in Wales. Life at the priory was initially precarious due to its isolated position in the Vale of Ewias. However it was saved by Baron Hugh de Lacy who rebuilt the priory's church on a grand scale, leaving a building that had a mixture of Norman and early Gothic styles. 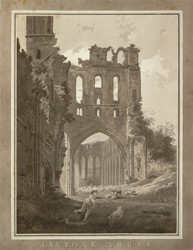 The monastic buildings had fallen into disrepair by the early 1700s, as can be seen in a series of prints and drawings made over the course of the century, showing progressively less of the building standing.